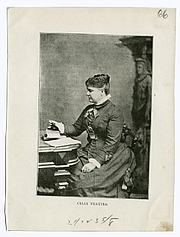 Celia Thaxter, née Laighton, was born in Portsmouth, New Hampshire, and grew up in the Isles of Shoals, 10 miles off the mainland, where her father Thomas Laighton was a lighthouse keeper and later a hotel owner. At age 16, she married Levi Thaxter, her father's business partner, 11 years her senior, and moved with him to Massachusetts. They had three sons. Celia's first poem, "Land-Locked," published in the Atlantic Monthly in 1861, was an instant success and made her the darling of literary Boston. She went back to live on Appledore Island (Maine) and became the hostess of her father's resort hotel, the Appledore House. She helped to attract many New England literary and artistic figures to the hotel and her salon there, including Ralph Waldo Emerson, Nathaniel Hawthorne, John Greenleaf Whittier, Sarah Orne Jewett, and Childe Hassam, who painted several pictures of her. She became one of America's leading writers of the late 19th century, beloved as a poet of nature and the sea. Among her best-known poems was "The Sandpiper." In 1894, she published the prose work, An Island Garden, with color illustrations by Hassam, which became her most popular book. A fire later destroyed the hotel, but her garden was reconstructed in 1977 by John M. Kingsbury, founder and first director of the Shoals Marine Laboratory. A documentary film, Celia Thaxter's Island Garden, was shown at the 2014 New Hampshire Film Festival. Celia Thaxter is currently considered a "single author." If one or more works are by a distinct, homonymous authors, go ahead and split the author. Celia Thaxter is composed of 4 names. You can examine and separate out names.